I Thought I Saw A Dinosaur! 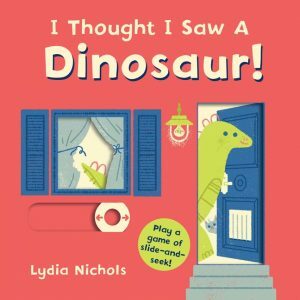 by Lydia Nichols is part of the “I Thought I Saw A” series—the other title right now being I Thought I Saw A Lion! This compact square-shaped, 10-page board book includes a slide-and-seek feature that encourages manually dexterity. Just move the easy-to-spot loop (it looks like a ring-shaped life preserver) in every spread to the opposite end of the cut-away area and presto, behold the dino! It could be anywhere in the house. Maybe behind the sofa or maybe in the shower (the shower curtain is my favorite slider). One thing is for sure, this chartreuse green dino is adorable and friendly so youngsters will be thrilled to find it. Nichols’s artwork has a cool retro feel, but most of all it’s warm and welcoming and makes for an entertaining game of slide-and-seek at home or on the road. Take a Look: More Fun Together! What’s more fun than playing alone? Playing with a friend! In fact, everything’s more fun together and toddlers will agree. First they’ll see bear resting, but after they slide apart the sturdy board book pages, they’ll see bear’s pal revealed. Is bunny crawling into her empty burrow? Nope her little ones await her! Use this 12-page book to discuss friendship, types of animals then come up with your own take on the colorful cast of characters including a cat, an elephant, a fish and some kids. Each slide-and-see page of Take a Look. 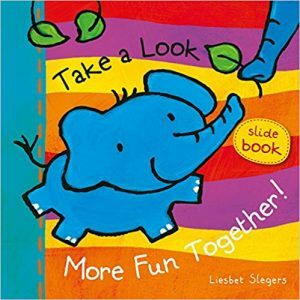 More Fun Together!, a delightful interactive board book, holds a sweet surprise. 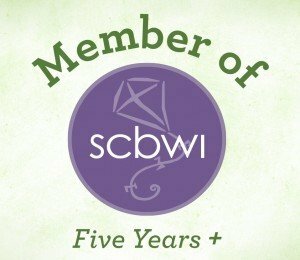 An adorable year round read. 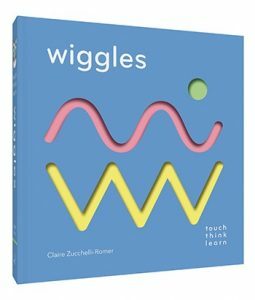 Let one, five or ten fingers linger on every page to explore the tactile fun that is TouchThinkLearn: Wiggles. The “fluorescent die-cut dots and playful, grooved paths” will entertain and engage children as they learn about shapes, color and movement in a totally unique way. According to Handprint Books, “The premise is simple: Hear an instruction, repeat its words, and playfully trace out its action.” Children won’t be able to resist. I couldn’t either, from my very first touch of the book’s spine and cover. The spirals inside pulled me in, but maybe it will be the the squiggles, dots or zigzags for your toddlers and preschoolers. Whatever captures their interest, they’re sure to find new ways to interact with this 26-page, vibrantly colored board book. Its innovative design and exuberant language promises to spark sensory curiosity in little learners. 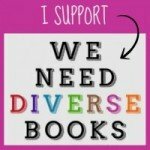 Find half a dozen other books in the terrific TouchThinkLearn series including Little Critters, Fly and ABC. Samantha’s sad that her burger’s been stolen, “And that’s the second one this week!” she cries to her brother who has a plan—concoct something that resembles a burger only fill it with fake food designed to hide creepy crawlies. What a wonderfully distasteful way to get back at the thief! That’ll certainly give the culprit something to chew on. This convincing, cleverly designed three-dimensional, lift-the-flap book is not for those who easily get queasy. 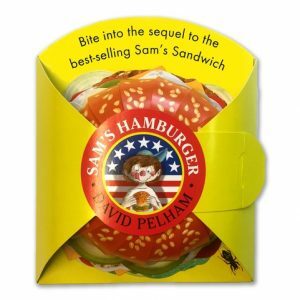 Sam’s Hamburger is a satisfying sequel to the best-selling Sam’s Sandwich, first published in 1990. It will introduce a new generation of young readers to this bright, bold, over-the-top, but cooked to perfection recipe for sweet (or sour) revenge. 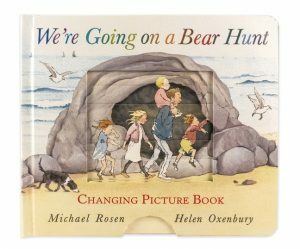 The award-winning classic from 1989 has had many iterations, but this latest, We’re Going on a Bear Hunt: Changing Picture Book, is one I think will please even Bear Hunt purists because it’s just so much fun. There are seven transforming pages including the cover in this 20-page board book. Each one brings movement and excitement to the spread where the changing pictures have been designed. The pull-down tabs switch from illustration only to illustration and the beloved sounds we all love repeating and in many cases have memorized: Swishy swashy! Splash splosh! Squelch squerch! Stumble trip! Hoo woo! and the ultimate, IT’S A BEAR! So when thinking of a baby shower gift, add this version to your list and help new parents have a beautiful day or plan on having one yourself! 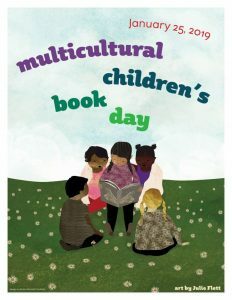 Check out another board book roundup here.